376 pages | 34 B/W Illus. This book explains the logic behind these interactions and cooperative attitudes in regions and cities. One of the most significant channels comes from the presence of a university and its collaboration with firms and scientific research centres. These mutual relations between academic institutions and enterprises are of key importance. The significance of universities in driving economic well being and regional development has been well documented for some time now. Much of the research, however, has centred upon countries in Western Europe and the United States. 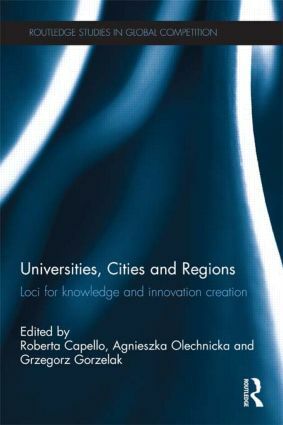 Increasingly, and since the expansion of the European Union in 2004 in particular, themes of academic entrepreneurship, university-business links, knowledge and innovation have become important on a Europe-wide scale. This book draws together key thinkers from across the continent to analyze the importance of higher educational institutions in fostering development. Roberta Capello is Full Professor of Regional Economics at the Polytechnic University of Milan, Italy. Agnieszka Olechnicka is Assistant Professor at the Centre for European Regional and Local Studies at the University of Warsaw, Poland. Grzegorz Gorzelak is Professor and Director of the Centre for European Regional and Local Studies at the University of Warsaw, Poland.